Camping chairs were a must. Everyone had their own hole to fish from that Andrew's dad had already drilled out by the time we arrived. Originally, Andrew was just going to take Jadon, but Isabelle wanted to come after we told her about it so it became a family outing instead. But of course, Isabelle was done fishing after only 5 minutes. Waking up early to head out to the lake didn't bode well with her and she was incredibly grumpy until she was able to just eat snacks and throw snowballs at everyone. Jadon seemed to enjoy it though. He doesn't usually complain about being cold and he enjoys fishing so he was fine sitting alone by his hole. Despite having a good size fishing crew, we all came away empty handed. It was a fun experience although catching fish would have made it better. Andrew liked to say that he brought his own fish just in case which was tuna on-the-go lunch kits. We also went home later that day and ate fish for dinner to satisfy his fish craving. Since we've had such a mild winter, the weather was surprisingly pleasant and we didn't freeze like we thought we would. The kids had a good time with the new experience and it was fun being out there with everyone. Since it was a drive to get to the lake, we decided to take a scenic (i.e. touristy) way home. After some driving around, we decided to visit the Railroad Museum in Helper, UT. 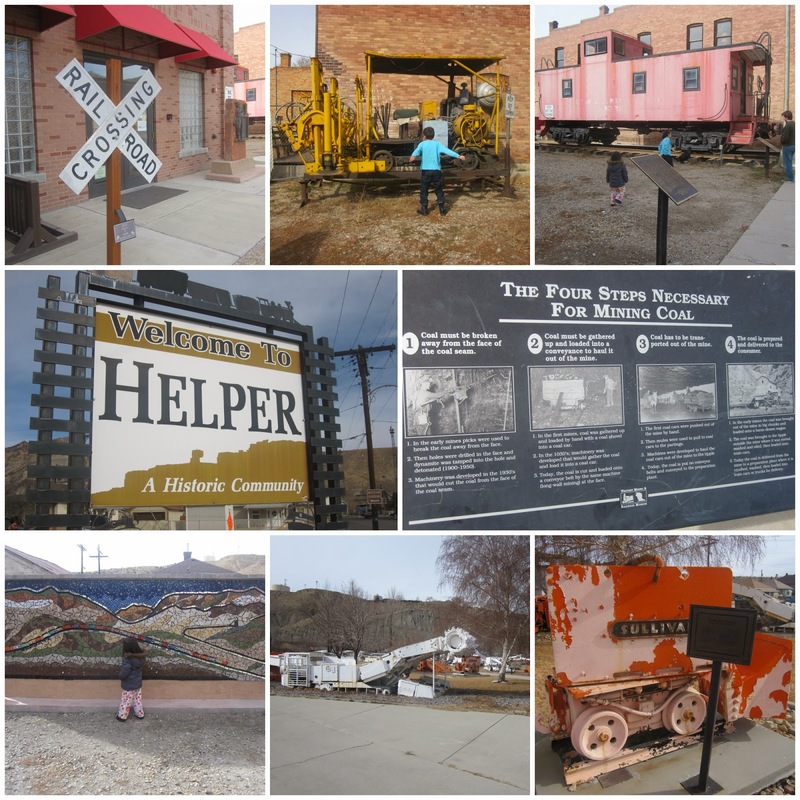 Helper was immediately off the freeway and there was a coal mining exhibit that we went through quickly. It had a lot of different coal mining machines for everyone to look at. The Railroad Museum ended up being closed, but we did get to see the outdoor trains which ended up being good enough for the kids. This quick 20 minute detour was good enough and we made our way home after our day trip.